picture 6. I have no idea why these attached sideways. Sorry.... figured Id post them anyway. Otherwise it would have been impact -- no ARCOM. We had a reserve pop in a Huey and contained it when I was the sport JM. Also, another sport jump, a demo low show, around 2K or so, new guy was so nervous, he dumped his PC in a pod on the floor just before he exited. I was in the hole and kicked his pod out. For those too young to remember pods, they were a sport version similar to the T-10 D-bags. You were hot stuff when you didn't use a sleeve anymore. It is not a "freefall" chute. 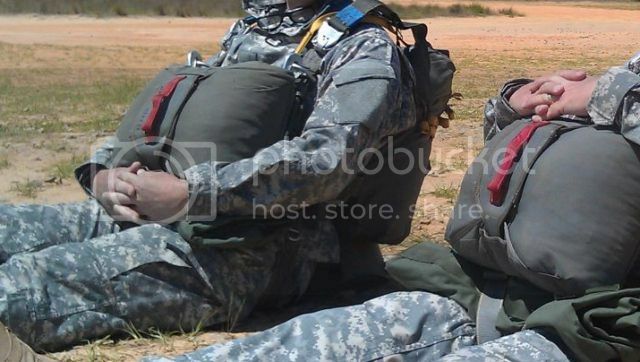 You can see the static line and the safety holding it plus they look different. I wonder if his main did deploy, though? You can't tell from the video. Looking at that video a few times, it's hard to tell what that is coming up off the pack. I thought it was his static line but when he goes off the tail you don't see it ride up to the top of the opening. I also didn't see any d-bag flapping the breeze or main chute deploy. Whatever it is, it seems to go with him out of the plane so unless he's not hooked up (unlikely for a SL JM down on the tail spotting), it doesn't look like a SL jump. But it all happens pretty fast. If you pause it at close intervals, you see the SL and a glimpse of what could be the D-bags in the top left corner of the ramp opening after the JM's violent exit. If that is not a SL chute, then it could be a 7-TU, but we haven't used those in a couple of decades... how about you guys ? Yep, the reserve, you can clearly see the orange "tube looking" spring loaded pilot chute. Saw four of them today just like it on Luzon...several people found out you cant pick up a reserve by the red handle! They got red handles? Really? Red...and compared to the T-10 Reserve, VERY touchy. Could prop blast/airflow get under the flap and activate it? Damn. That is an interesting situation/topic. When JM'ing, I only had to JM -1Bs and XXs, I never dealt with anything else. When you SF dudes JM foreign troops, are you doing a fam workshop on their rigs before JM'ing, or do you leave JMPIs to the foreign JMs?